XM135 is Duxford's preserved F.1, and very nicely presented she is too. Wearing 74 'Tiger' squadron colours, I suspect it's the Tigers scheme from when they were the RAF's display team back in 1961/1962. XM135 was the very first full-production Mk.1, first flown on 14th November 1959. She served with the CFS at Coltishall from May 1960, then moved on to 74 Squadron, 226 OCU, the Leuchars TFF and was delivered to storage with 60 MU in June 1971, becoming the last F.1 to fly in the process. 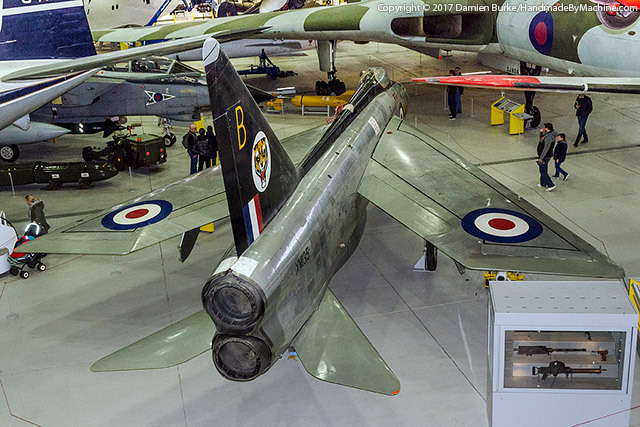 She was disposed of to the IWM in 1974 and has been on display at Duxford ever since. XM135 is famous for being the aircraft in which an engineering officer had an extremely scary experience when some ground running tests went badly wrong... on 22nd July 1966, the aircraft was with 33 MU at RAF Lyneham being worked on to fix a persistent electrical fault that only showed up when the aircraft was accelerating. Wing Commander Walter "Taff" Holden was undertaking taxiing tests to see if he could replicate the problem. The canopy was off, ground locks were in on the undercarriage and the ejector seat safety pins were in. Initial slow(ish!) speed taxi runs on Lyneham's 'lazy' runway did not show up the fault, so Taff tried a further run but inadvertently advanced the throttles too far into the reheat position; now a Lightning doesn't give you much time to think in reheat, and before Taff could figure out that the throttles hadn't jammed but were just through the reheat gate, disaster loomed in the shape of a fuel bowser crossing the runway in front of him. Just missing this, he was soon about to cross the main duty runway - as a Comet on its take off run shot past! Having avoided disaster twice by pure luck, the end of the short lazy runway was coming up fast and he had no choice but to lift off, having had no luck trying to get the throttles back to idle - and having run out of time to do anything about it. Luckily Taff had some limited hours on lighter prop-driven trainer aircraft - Tiger Moths, Chipmunks and Harvards - and this experience enabled him to calmly explore the aircraft's handling and make some attempts at landing. His first two attempts to line up on the runway didn't go well but on his third attempt he got it right - and only made the error of landing in the attitude a tailwheel aircraft would, with the result that he scraped the tail and in the process cut the brake chute's cable. When he deployed the chute, then, it simply dropped off immediately and he had to rely on the wheelbrakes alone to stop him before the runway end. This they did... with 100 yards to spare. Unsurprisingly some years after the event Taff suffered some post-traumatic stress problems but recovered fully with some help. It is a remarkable story and to have the aircraft still in existence over 50 years later is a bit of a bonus. Sadly Taff passed away in December 2016.